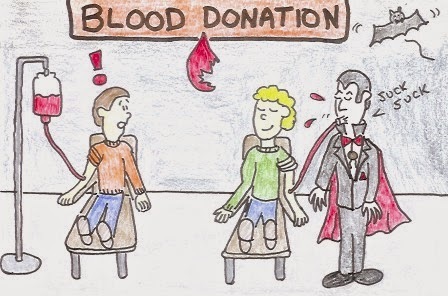 It's okay everyone, the vampire has sickle cell anemia. He just likes to cut out the middle man and go directly to the source. Before he was turned he felt the same way about his organic tomatoes and would make a 3-hour drive to a tomato farm every weekend. It wasn't lost time though, he hit a lot of antique dealers on the way. That's why he already had a Gothic coffin. In hind sight that might have been a higher power providing some foreshadowing.